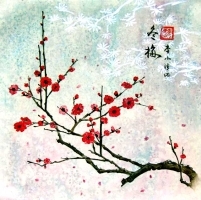 The technique of painting Mogu is a kind of the Gongbi. But, contrary to Gongbi, it does not trace contours. It is what its name evokes: Mo without and Gu bones. As for the technique Gongbi, Mo Gu is practised on not absorbing paper (Shu Xuan). The brushes are the same ones as for Gongbi, but without those which are used to trace contours. Thus we use two special brushes Yang Hao called BaiYun: one to apply the colours and the other, soaked with water, to moderate them and degrade them. The first consists in tracing the sketch on a sheet with a pencil 2B. Then place this sheet under which one you want to paint. You will be able to see the sketch by transparency. The second method consists in initially tracing the sketch on a usual sheet of paper (Western or Chinese, it does not matter). Then you place this sheet on the paper which you want to paint, the sketch upwards. With the pencil, you trace again on contours in order to leave a print on the sheet under. This one then has slightly printed contours. You can then start to paint it. If printed contours are not sufficiently visible, you can slightly recall them with the pencil 2B. This method is longer, but it makes it possible to not damage the rice paper and also to re-use the draft to remake a similar painting. It is done in several stages. Before undertaking each stage, it should be taken care that the colours applied previously are quite dry. First you apply the colour with one brush. Then, with the other brush soaked with water you shade and degrade the colours. For two colours, you first make a shade of a colour as described above. When painting is dry, you make a shade of the other colour on the basis of the other side and going in the opposite direction. The techniques are much diversified and vary according to the subjects.